I’ve been on a semi-sabbatical for a while, doing some good, studying for a master’s degree, and sorting out some plans for the next fifty years. In business, when a discussion starts straying off topic, we say, “Well, that may be a good topic for a graduate seminar, but we need practical solutions here.” I’ve just spent a couple of years in graduate seminars, rarely getting to the point, wandering up and down rhetorical byways, never calling the question. I’ve been reading and writing up a storm, but not for publication. It’s been a lot of fun, I’ve learned a lot, but it’s time to get back to work. Stay tuned. 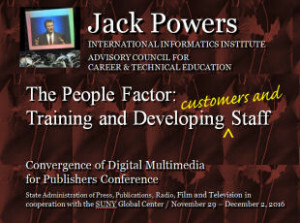 For a visiting group of media executives from China, I’m giving a talk on building a new media team inside an existing print publishing operation. Not only do you have to train your staff to create innovative interactive products, you also have to train your customers in what’s possible and why it’s better than print. The terrific people at the Graphic Communications Scholarship Foundation have graced me with the designation Champion of Education with a celebration scheduled for the 2014 scholarship awards ceremony in June. It’s a great feeling to be honored by your colleagues for doing work you’re proud of, but it’s also a bit daunting to think of all the work that still needs to be done. All of us, from pre-school to K-12 to college and grown-up life, need to learn more faster and better. The GCSF Champion of Education Award honors exceptional individuals in the graphic communications field who have contributed their time, resources and talents to advance the industry’s understanding and to prepare its next generation. It’s an important industry event raising money for a great cause. For a session at the United Federation of Teachers, here are my slides with: a quick update on NYC CTE partners’ activities; a recap of an excellent job market briefing we got from the New York State Department of Labor; some stats about college completion; and a look at the increasing dissatisfaction with the way higher education has been churning out degrees that go nowhere. In addition, I use stats and art from several studies: From Wall Street to Wall Mart, Diplomas and Droputs and the just-released Harvard report Pathways to Prosperity. Now that I’m a graduate student, I’ve been looking at the troubling results of the nation’s push towards college-for-all. London architecture student Keiichi Matsuda has posted a brilliant and scary visualization of the near future of augmented reality. Saletan on the state of the world as we live it through technology. Today’s AR apps don’t offer a solid user experience. A new study urges physicians to use stimulus spending to install electronic medical records.